NASDAQ is a great source for stock market data. We will demonstrate how to write a scraper that will extract some key stock data based on a company’s ticker symbol. 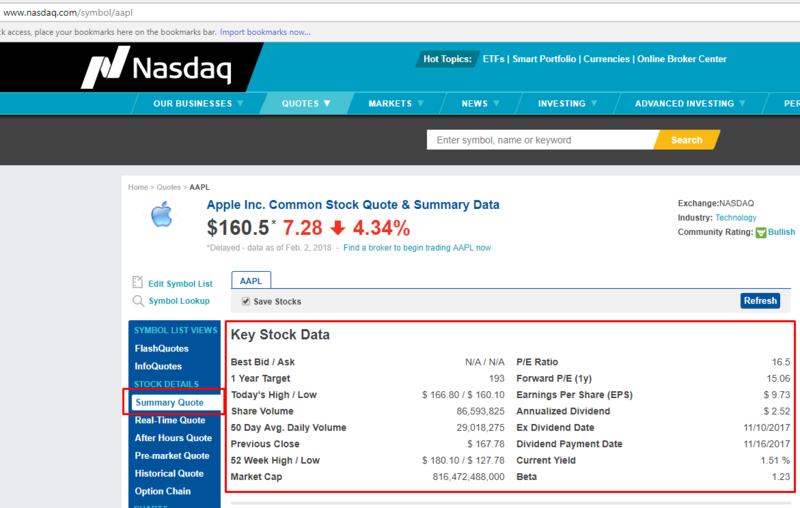 In this tutorial, we will extract the summary quote for a public company from Nasdaq. Below is a screenshot of the data we will be extracting. Before we start building the scraper, we need to find where the data is present in the web page’s HTML Tags. You need to understand the HTML tags inside the page’s content to do so. Right-click on any link on the page and choose – Inspect Element. The browser will open a toolbar and show the HTML Content of the Web Page, formatted nicely. If you look closely at the GIF above, there is DIV tag, with its attribute called ‘class’ as ‘table-table’. This DIV encloses the data we need to extract. We will use Python 3 for this tutorial. The code will not run if you are using Python 2.7. To start, you need a computer with Python 3 and PIP installed in it. Most UNIX operating systems like Linux and Mac OS comes with Python pre-installed. But, not all the Linux Operating Systems ship with Python 3 by default. and press enter. If the output looks something like Python 3.x.x, you have Python 3 installed. If it says Python 2.x.x you have Python 2. If it prints an error, you don’t probably have python installed. If you don’t have Python 3, install it first. Python Requests, to make requests and download the HTML content of the pages ( http://docs.python-requests.org/en/master/user/install/). "User-Agent":"Mozilla/5.0 (X11; Linux x86_64) AppleWebKit/537.36 (KHTML, like Gecko) Chrome/64.0.3282.119 Safari/537.36"
You should see a file AAPL-summary.json called in the same folder as the script, with the extracted data. Here is some sample data extracted from Nasdaq.com for the command above. The data will be saved as a JSON file. Instead of writing the data to a JSON file you can connect it to a MySQL database. You can download the code at https://gist.github.com/scrapehero/c7794d9e4522d9c72ba167496b849228. Let us know in the comments how this scraper worked for you. This code should be capable of scraping the details of most ticker symbols. If you want to scrape the details of thousands of companies you should read Scalable do-it-yourself scraping – How to build and run scrapers on a large scale and How to prevent getting blacklisted while scraping . If you need some professional help with scraping websites contact us by filling up the form below. Yahoo Finance is a good source for extracting financial data. 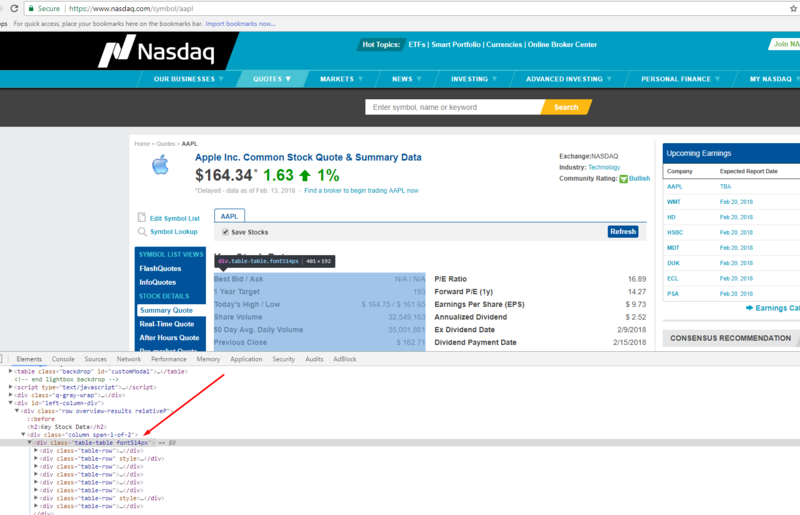 Check out this web scraping tutorial and learn how to extract the public summary of companies from Yahoo Finance using Python 3 and LXML. I also have a question : while you defined a function called “parse_finance_page(ticker)” in your code, I could not call it to try and run your code. It seems like you missed putting in the ticker symbol. Can you try running it like this ? What line of code do you enter in aapl, every time I try line 11 it gives me an error for spacing. I ran it in python3 , but when I get to write down the json, it goes to anaconda python2.7 and some error occurs. How can I run this code through Spyder? Where can I enter the ticker symbol?